Note: The lawsuit in its entirety, as well as evidence submitted in the case, can be read at the bottom of this page. The woman who publicly accused a former aide to Illinois House Speaker Michael Madigan of harassment filed a federal lawsuit Wednesday alleging that the powerful lawmaker's political committee and the Democratic Party of Illinois ignored her complaints of inappropriate conduct and retaliated against her for bringing them forward. Political consultant Alaina Hampton, 28, contends that Madigan's organization prevented her from advancing professionally after she reported allegations of "severe and pervasive sexual harassment at the hands of her supervisor Kevin Quinn," the suit reads. 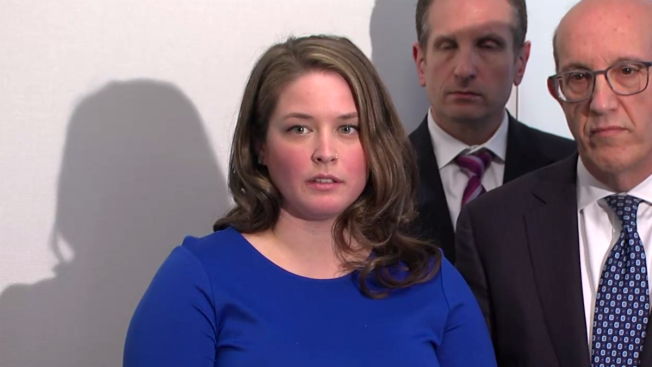 Hampton first spoke publicly on Feb. 13 to detail allegations she made against Quinn, a high-ranking political aide that Madigan announced the day before had been fired. She said Quinn harassed her for five months beginning in fall 2016, making multiple unsolicited advances and sending inappropriate text messages at all hours, even after she said she told him repeatedly that the relationship was strictly professional. Quinn, who worked for the speaker for nearly 20 years, is the brother of 13th Ward Ald. Marty Quinn - perhaps Madigan's most senior operative and a figure that Hampton called her "mentor." Hampton said she reported Kevin Quinn's inappropriate behavior to his supervisor, Ald. Marty Quinn, in February 2017, but received "no real solution." She left the organization that April because "there was no way" she could continue to work with Kevin Quinn, the lawsuit reads. Hampton said she then wrote a letter to Madigan in November to explain her decision to leave because she did not want him to think she "abandoned [her] job for no reason" and "in hopes of returning to work on upcoming campaigns," the lawsuit reads. Hampton said in the lawsuit that she was then contacted by Madigan's attorney, who Hampton claimed "minimized the sexual harassment I experienced and falsely told me that the party was not getting involved in a specific campaign for which I was well suited to provide assistance and wanted to work on." The campaign in question was the Democratic primary for Illinois' 5th District, for which Hampton had previously managed state Rep. Juliana Stratton's successful campaign. Hampton's lawsuit alleges that Madigan's organization "selected another individual" to run the campaign, despite the claim that the Democratic Party of Illinois would not be involved. Throughout this time, Hampton said Kevin Quinn "continued to work in a supervisory capacity" and was only fired as part of what she had previously called a "cover-up," though Madigan said in a statement at the time that he was terminated "after a thorough investigation." Hampton's account disputing how the harassment allegations were handled, as well as the termination of another high-ranking operative in Madigan's organization over misconduct complaints later that week, have put the country's longest-serving House speaker under a microscope. Illinois House Speaker Michael Madigan released a list of nine complaints that include harassment or discrimination over the past 5 years inside his office. Patrick Fazio reports. The lawsuit alleges the Friends of Michael J. Madigan committee, as well as the Democratic Party of Illinois, which Madigan chairs, that employed Hampton violated her civil rights, claiming they "retaliated against Ms. Hampton for reporting and opposing sexual harassment by, among other ways, failing to hire her and/or allow her to continue working for them in her former role for which she was qualified." While the suit seeks damages, Hampton said at a news conference Thursday that the case had larger implications. “This is not simply about standing up for myself and my own career,” Hampton said. "The pleading is being reviewed by counsel," Madigan spokesman Steve Brown said in a statement. "However, I can assure you that the Democratic Party of Illinois and the Friends of MJM have not retaliated against Ms. Hampton in any way," Brown added.